As a proud father I traveled to Atlanta to see my daughter receive an outstanding service and dedication award at a local University. 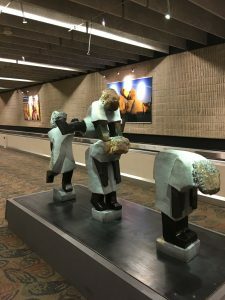 As I arrived early in the morning at the Atlanta Hartsfield Airport I decided to walk from the D Concourse to the MARTA Station figuring it would be about a 20 minute walk. I immediately noticed that I was among the few who walked between the concourses. Everyone seemed to be in hurry getting onto the train that will whisk them away to another concourse or to baggage claim. 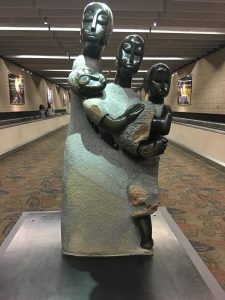 As I entered the lonely corridor between the concourses I was greeted by an exhibit of sculptures depicting the importance of the family as seen through the eyes of African artists. I stood there mostly alone looking at these stone forms of African families and reflected on why no one is paying any attention to these pieces of art. 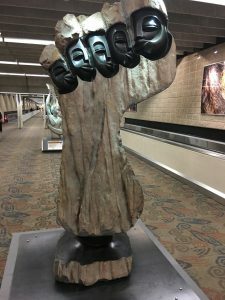 Thousands upon thousands of people travel through this airport daily and are either unaware or too busy getting to their destination that they neglect to stop to appreciate the time and effort that these artists have gone through to show the importance of the family in African society. 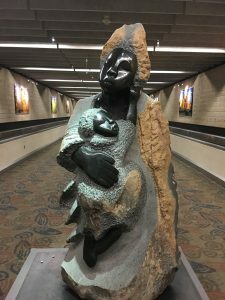 Being abundantly Pro-Life, I began to look at theses figures through the eyes of someone who is sensitive with the struggles and importance of family life not only to those in Africa but also to all communities especially the African American Community. So I stood there staring down the corridor sadly watching the world catch a train as the “Importance of the Family” was ignored. 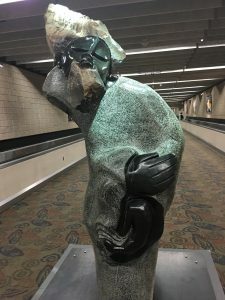 In Joe Matasa’s sculpture “Protected Family” the artist depicts a mother, father, and child encircled by a protected hand. As I looked at the protected hand I envision it to represent a society and government generations ago. A society that protected its most vulnerable and strengthened the family. Today I see a hand whose grasp is loose, allowing the culture of death to come between father and mother resulting in a lost child. 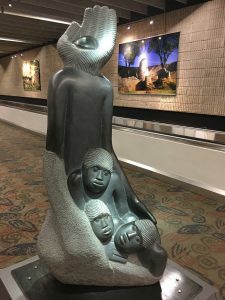 In Sylvester Mubayi’s piece “The Protecting Spirit” a figure resembling an eye oversees the children protecting them from harm. Today, I envision a blind eye or a eye that is just too busy being led astray. Are we as a society too busy getting on our trains to notice the culture of death that tricks the eye to believe that abortion is healthcare and something that empowers? We have organizations like the United Nations putting pressure on countries that in order to accept aid that they have to accept abortion on demand. Are we as a society going to accept this punch in the eye without a fight? In Gladman Zinyeka’s “Who Will Raise The Child” the artist laments the AIDS epidemic that has devastated the continent. Abortion not only kills but wounds. The devastating effects of low self esteem, depression, and dependency by the mother coupled with aggression, loss of identity, and shrinking of responsibility by the father grieves me to ask the same question. Who will raise the child? 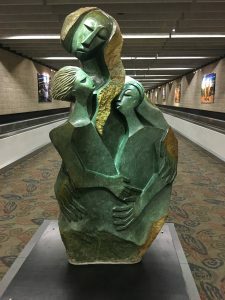 In Amos Supini’s “Traveling Family” the sculptor depicts a whimsical traveling family. He prides himself with giving a voice to the voiceless and expresses things people often can not express themselves. 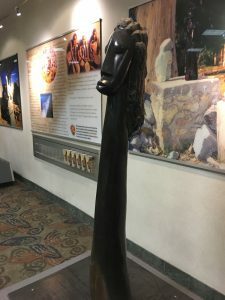 As I look at this sculptor what comes to mind is that the father, the big toe, is turned toward the other family members giving an assurance of protection and stability. This feeling of strength leaves an aura of tranquility and stability to the rest of the family as you can see from their state of restfullness. You can see the feeling of closeness and intimacy as they are turned toward each other. The importance of family togetherness is very apparent to the culture of Africa. It is something we should envy here. Abortion tears the bonds of family by creating a culture of death and secrecy. How do you protect the importance of family? In Gedion Hyahandos’s “The Generation Pyramid” the artist depicts four family members of different ages signifying different stages of life. He calls us to celebrate and value each phase of life. Are we valuing all stages of life? Are we celebrating with others when they receive awards, holding each other’s hand through sickness and other trials, honoring those who reached their golden years, and giving a hand up to those who are struggling or, are we too busy trying to catch a train? In Gedion’s “The Peacemaker” he portrays an elder that seems to be patiently listening to the shifting values of society. We cannot permit leaders in any community especially the African American community to stand idle and patiently permit the culture of death to continue to invade the fabric of the society. There is a difference between being peaceful and being a peacemaker. In this figure I see hands that appear bound. I am left wondering, has this leader taken the easy peaceful path of notoriety and riches in exchange for his silence? In Dominic Benhura’s “Leap Frog” you get the sense of joy and feeling of movement. I an reminded that the culture that celebrates death as a personal right is a movement that is prepared to eliminate 2 of these children from the womb if a mother so desires. By the time that you have spent reading this post another 4 children in this country have perished from those who profit from abortion. If that does not make you want to get off the train I don’t know what will. For those who have fallen victim to the sweet lies of the abortion industry I am reminded of Norbert Shamuyarira’s “How Can I Rise”. 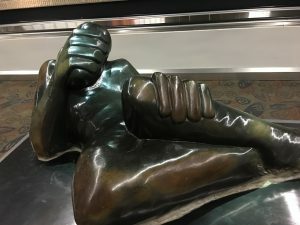 The sculptor depicts suffering and anguish that is highly personal and speaks to the inner spirit. When I look at this figure I don’t see what those who profit from abortion want us to see… a defeated mess that will avoid acceptance of the humanity of the preborn at all cost. No, I see hands of strength that is reaching out to places of hope and forgiveness and legs that are on the verge of standing up to expose the truth about the lies that have kept the figure from standing upright for so long. I see a figure on the verge of freedom. In Agnes Hyanhango’s “Conversation” I see women coming together in combined strength fighting with the truth against Planned Parenthood and others who profit from the culture of death. Only by coming together does this artist see growth and change. We need to take a more active role in engaging in the conversation of life affirming choices. We need to speak up for life so the mother and baby depicted in Agne’s piece ‘Welcoming Baby” has a safe place to bond. This scene should be a very common scene if we as a society are willing to slow down, get off our trains, and work on what matters most. 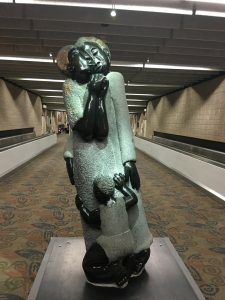 We need to demand that the family and its importance be front and center and not tied down to a seldom walked corridor like the one I was at the Atlanta Airport. 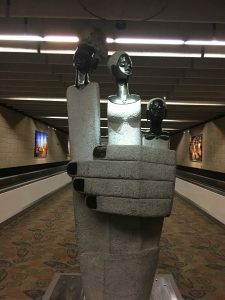 You may be one of the hundreds of thousands of passengers that travel through Atlanta’s airport on any given day. Why don’t you make an effort to go visit this exhibit and see if you are as moved as I was for the value of the family and especially the struggle of the African American family and what the culture of death has taken from the fabric of this country. Before I leave you, Norbert Shamuyarira’s “Waiting” depicts a solitary figure that exposes the vulnerability in having expectations. He states that the expression of melancholy is a form of a self protective gesture. Have you seen this look before on those who have given up hope? We need to do a better job of introducing them to the true Hope that is Jesus. We need to share our faith and let others know that if you put you expectations and hope in God’s Son then there is no vulnerability or condemnation but a true joy. 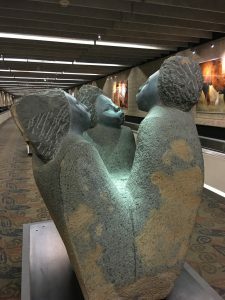 The next time I go through the Atlanta Airport I would like to see the exhibit crowded with people who are willing to make an investment in walking the corridor and reflecting on a hope for not only the importance of the African family but for the hope found in God’s grace.